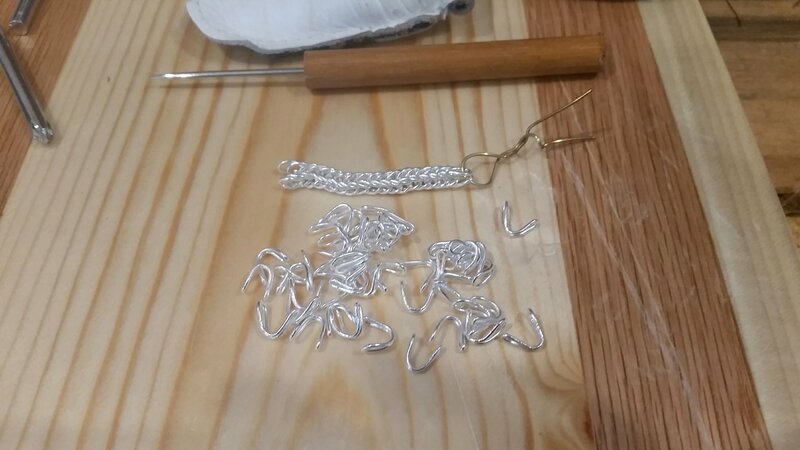 I accidentally started making a new chain today. It wasn’t what I had planned to do…. I cut & fused more fine silver links this morning, and that was going to be my project for the day. Then this afternoon I started thinking about the chain I want to make with them. I couldn’t remember exactly how to start it, so I got out Classical Loop-in-Loop Chains & looked it up. Then I thought, well, I’ll just get it started. The links of course take additional prep, they have to be shaped and annealed. Next thing I knew, it was an hour later, I had an inch & a half of chain, and 50 more links ready to use. I think it’s a good sign to fall into flow that way. This entry was posted in Art, Metal and tagged 100 Days of Metal, Chains, Fine Silver, Jewelry, Silver. Bookmark the permalink.